These PRAT 502 Refills are for use with the PRAT Pampa Leather Spiral Book and PRAT 149 Spiral Modebook. Availability: Usually ships in 2-3 business days Add To Cart to view ship rates and delivery dates. Prat 502 refills are for use with the PRAT Pampa 5x7 Leather Spiral Book. Includes 10 sheet protectors and inserts. Prat 502 refills are for use with the PRAT Pampa 8x10 Leather Spiral Book and PRAT 149 Spiral Modebook - 10x8. Includes 10 sheet protectors and inserts. Prat 502 refills are for use with the PRAT Pampa 8-1/2x11 Leather Spiral Book, Pampa 8.5x11 Spiral Book and 149 11x8.5 Spiral Modebook. PRAT 502 refills are for use with the PRAT Pampa 11x8.5 Landscape Leather Spiral Book. Includes 10 sheet protectors and 10 black acid free paper inserts. Prat 502 refills are for use with the PRAT Pampa 9-1/2x12-1/2 Leather Spiral Book and Pampa 9.5x12.5 Spiral Book. Includes 10 sheet protectors and inserts. PRAT 502 refills are for use with the PRAT Pampa 12.5x9.5 Landscape Leather Spiral Book. Includes 10 sheet protectors and 10 black acid free paper inserts. Prat 502 refills are for use with the PRAT Pampa 11x17 Leather Spiral Book and PRAT 149 Spiral Modebook - 17x11. Includes 10 sheet protectors and inserts. PRAT 502 refills are for use with the PRAT Pampa 17x11 Landscape Leather Spiral Book. Includes 10 sheet protectors and 10 black acid free paper inserts. These PRAT 502 Refills are for use with the PRAT Pampa Leather Spiral Books and PRAT 149 Spiral Modebooks. 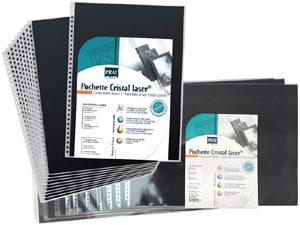 Packs include 10 clear archival quality sheet protectors (20 views) and 10 black acid free paper inserts. Compatible with PRAT Pampa Leather Spiral Books & PRAT 149 Spiral Modebooks.